An article on the Daily Beast Sunday points out that the two hoteliers who hosted Ted Cruz — Ian Reisner and Mati Weiderpass — did so because of Cruz's “support” for Israel. That seems more like a justification for massaging the egos of these two self-absorbed schmucks. It reminds me of a GOProud event in New York City. GOProud paid Ann Coulter to insult them (all of us really) and they got what they paid for and GOProud no longer exists. Jewish gays might be a bit neurotic (oy veh) but we are generally sane. Mr. Reisner and Mr. Weiderpass would be quick to point out the difference between gay rights in Israel and the Muslim world and they are right — to a point. Admittedly, the Palestinians are very bad people. They are anti-Semitic homophobes with terrorist origins who are prone to extreme violence. In Gaza, male homosexuality is illegal carrying a penalty of up to ten years in prison. In both Gaza and the West Bank (clients of Hamas and Hezbollah respectively) LGBT persons have no rights whatsoever. Palestinians do not believe that Israel has a right to exist. I do. Having said all that, the only realistic strategy to achieve relative peace in the Middle East is the two-state solution (an independent Palestinian state along the west bank of the Jordan River). This was the goal of President George H.W. Bush. It is the stated goal of President Obama. Mr. Cruz is opposed to a two-state solution. Mr. Cruz does not get there through a reasoned assessment of foreign and social policies. Mr. Cruz opposes this for the same reasons that he is an anti-gay bigot. It's a biblical thing. While I am admittedly over-simplifying the matter, the conventional thinking among conservative Christians is that only God can divide Israel and that piece comes only after the Rapture (when all the Jews die) which might not happen if Israel is divided. Moreover, Cruz is probably as anti-Semitic as the rest of that lot, believing that Jews are infidels for not accepting Jesus Christ as their lord and savior. Ted Cruz opposes even the most basic nondiscrimination measures for LGBT citizens. 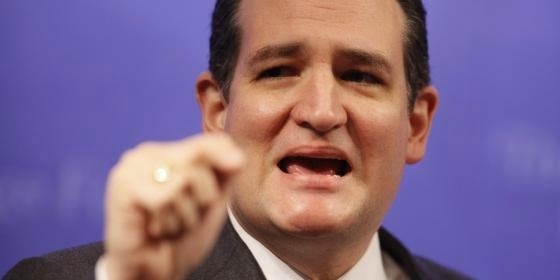 How dare Ian Reisner and Mati Weiderpass overlook Mr. Cruz's appalling disdain for the gay community? Tony Perkins has the same views on Israel as Cruz. Why not have a little wine and cheese party for that idiot?